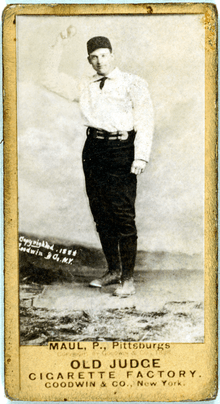 Albert Joseph "Smiling Al" Maul (October 9, 1865—May 3, 1958) was a professional baseball player. He was a pitcher over parts of fifteen seasons (1884–1901) with the Philadelphia Keystones, Philadelphia Quakers/Phillies, Pittsburgh Alleghenys, Pittsburgh Burghers, Washington Senators, Baltimore Orioles, Brooklyn Superbas and New York Giants. He led the National League in earned run average in 1895 while playing for Washington. For his career, he compiled an 84–80 record in 188 appearances, with a 4.43 ERA and 346 strikeouts. Maul was born in Philadelphia, Pennsylvania and died there at the age of 92. "Al Maul". Find a Grave. Retrieved September 3, 2010.